We all have a story. It's the years woven into our souls that make us the people we are. What we learn when fitting you for shoes barely scratches the surface of who you are. When you walk into our store, we want to know more about you as human beings. We think you should know a little more about us, too. 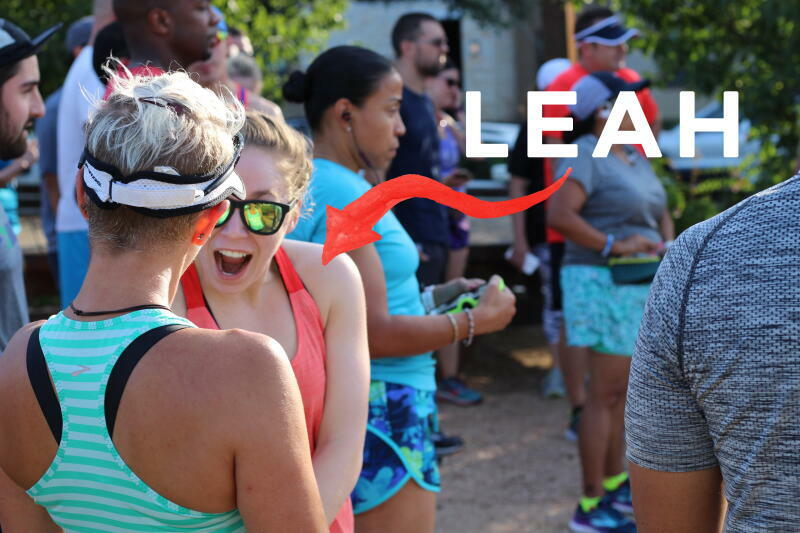 This is a peek into Leah's story; an abridged glimpse into where she came from, where she's headed and why being a part of the Fleet Feet family has given her more than just an encyclopedic knowledge of everything running.
" I started running when I was in the 4th grade. Every year at my school they would do this 2 mile race for the kids under 6th grade because we were not capable of training through an entire season and racing more than once. I played volleyball from 5-8th grade and did cross country during this time as well. I was never gifted/coordinated at sports but I liked being on a team and my private school cross country team consisted of 2 people so that was not fulfilling. When I got to high school, I stayed on the volleyball team for the freshman year but riding the bench every Saturday frustrated me so I decided to join a team where there was no bench, you either competed or you didn't, which I loved. I ran Cross Country from 10th to 12th grade but didn't get competitive or run varsity until I was in the 12th grade. I was running a JV 2 mile race in San Angelo one morning, I remember it was cold because I was uncomfortable and thinking about getting back on the bus when the girl in front of me at the half mile spit and through dumb luck and physics, I ran right through her stream of spit so it landed on my shin. This obviously infuriated me and I decided that I no longer wanted to be a member of the pack and broke free. This is also the first race I started throwing elbows, an art form. I ended this race in the top ten. My coach moved me over to sub varsity for when the top 5 girls weren't performing well and the love affair was born. I had also started swimming when I was a junior in high school because it was 2008 and everyone swam because of the Olympics being swim dominate that year. When I got to college, instead of running, I swam for all four years but used running as my me time to decompress and de-stress. I was not good at swimming so in hindsight, joining the cross country team would have been better. When I graduated college in 2013, I enrolled in graduate school and after bouncing between temp jobs, starbucks, and bakeries, I walked into the fleet feet .25 miles from my front door and told them I was willing to work the weekends and the poor hours because I honestly just wanted to pay my way through grad school. Through working at Fleet Feet I befriended the then owner, who graciously took me under her wing and not only made me act more like an adult but also encouraged me to run, race, and be merry. I joined the training programs through Fleet Feet and had the coach at the time tell me that I could be competitive in the local running scene if I applied myself. 2 years, multiple injuries, and finally a strong/well-rounded training season later I had traversed nearly 3000 miles, and finally made the qualifying standard for Boston. It was bittersweet because I was still too slow to be allowed into the race but that means I just have to keep trying. Being a FIT Specialist has been the best thing for me in my counseling career because I have learned what it means to give quality customer service and actually listen to what a customer is trying to say, not what words they use. This experience has been beyond valuable in my career and in the relationships I hold dear with the people I love the most. Outside of Fleet Feet, I am a coffee addict, a nap officiando, and an anxious knitter (I specialize in scarves). I can be found sleeping, with my hand in the cookie jar, or begging to dog sit your fur babies."